How to buy Bitcoin? 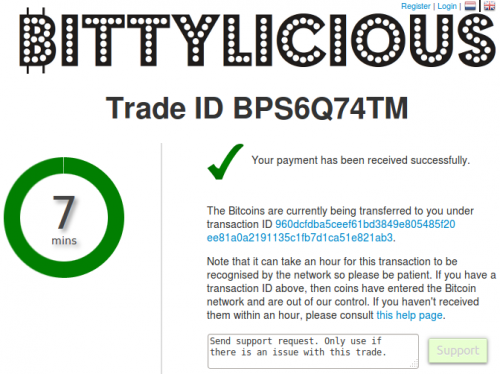 There's only one thing you need before buying Bitcoins with Bittylicious - a wallet in which to store your Bitcoins. Bitcoin wallets enable you to send and receive Bitcoins with other users, and each user or business in the Bitcoin ecosystem has a wallet. Wallets can be generated online (web wallets), by running a Bitcoin client on your own machine (local wallets), or by buying a small device (hardware wallet). If you prefer to see a neat video presentation showing how to get a wallet and take your first steps, check out the MyCurrencyTransfer blog. This is the easiest way to get started in the Bitcoin world. It is the least secure, but when starting off and if you exercise good security, you should be OK. Web wallets host your cryptocurrency. This means, to varying levels, that you are trusting the company that hosts the wallet to look after it on your behalf. In many ways, this is more secure than looking after the wallet yourself, but it does mean that it is possible for them to lose your cryptocurrency following any incident on their side. Note that these providers might also offer a way to convert money into Bitcoins. 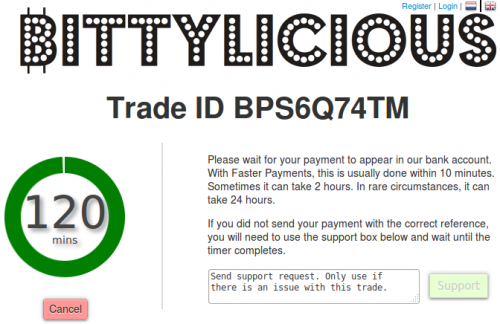 You're welcome to do that, but you'll usually get a better price using Bittylicious. We recommend you just use the above sites for their wallet functionality alone. These are more complicated to set up, but involve you being in full control of your Bitcoin wallet. This is great in many ways, but unless you're confident that your computers are secure and you're relatively tech savvy, we wouldn't recommend doing this. If all goes wrong and your computer explodes, you've probably lost your Bitcoins. Bitcoin Core - the full Bitcoin client. Takes a very long time to get synchronised so we do not recommend it for new users. However, it is considered the de facto Bitcoin client. Multibit - a secure, lightweight, international Bitcoin wallet for most popular operating systems. Electrum - easy to use, lightweight Bitcoin client for most popular operating systems. Armory - an advanced Bitcoin wallet for most popular operating systems. Mycelium - an easy to use Bitcoin wallet for Android and iPhone. If you are buying any serious quantity of cryptocurrency, we strongly recommend getting a hardware wallet. These are the most secure way to store cryptocurrency by a long way. Ledger, producers of the Nano S.
Trezor, who were the first on the block. 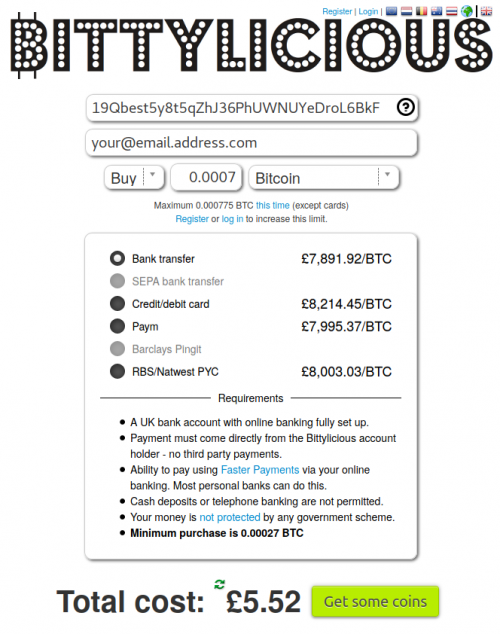 Now that your wallet is set up, you need to generate a Bitcoin address. Each wallet has its own way of doing this but it should be relatively straightforward. A Bitcoin address will look something like 19Qbest5y8t5qZhJ36PhUWNUYeDroL6BkF. Step 1 - What do you want to buy? Here, you simply copy and paste your Bitcoin address into the top box and type in how many Bitcoins you want into the second box. The number of Bitcoins you can buy at any time is limited by our calculation algorithm. If you register your email address and perform various validation requirements, you can buy more. Once you have entered the details, click Get some coins. This screen presents all the details you need in order to make an bank transfer from your bank account, however the details can potentially change on every trade so make sure you are using the correct ones. You will need to log into your online banking with whatever bank you use (e.g. Halifax, Santander) and make a transfer. This will usually be under a heading like Make a funds transfer or Pay a person. This page tells you what sort code, account number and name this payment is going to, and it also provides the reference. It is essential that you copy and paste this reference into the Reference box in your online banking. 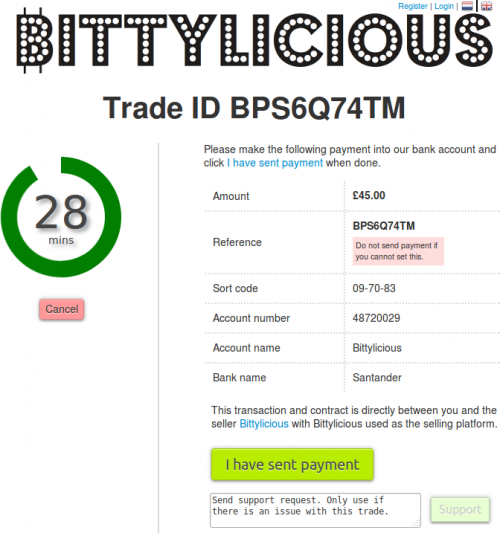 It is important to note that the bank account the payment comes from must match the name that your Bittylicious account is registered under. Also, make sure that you don't bank with one of the banned banks. The above image is just an example page you might get. Please do not use the account details above, but use the details you are given when you start a new 'real' trade. Only when the payment is completed according to your online banking should you click I have made payment. Now you just need to wait for the payment to be received by the broker's bank. This is usually complete within a few minutes, but sometimes banks can be slow so we allow two hours for this to complete. Here, confirmation is provided that the payment has been received. You will also see a long string of letters and numbers that denotes the unique transaction ID for this payment. This transaction ID is the Bitcoin transaction and if you click on the link, you will see information on the payment including the address you are sending the Bitcoins to. You will usually receive the Bitcoins in your wallet within the hour, but if you are waiting longer, please see our guide titled Coins have not arrived. This page was last modified on 15 April 2019, at 23:52.